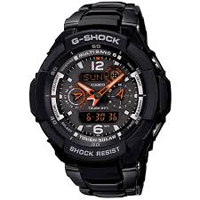 Designed for high-impact, this G-Shock Premium digital and analogue men's watch has a dual layer dial with a grey LCD display. Features include multi band 6 radio controlled technology and a solar atomic timekeeping system which enables the watch to generate power to keep the watch functioning accurately with minimal exposure to normal lighting. 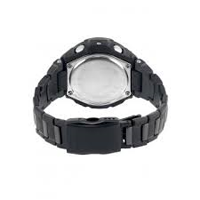 The watch is secured with a metal strap. A built-in radio signal receiver ensures that the exact time is displayed across Europe, The United States and Japan AND China. 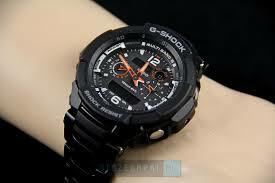 A stopwatch that counts backwards: When 0 minutes, 0 seconds is reached, the timer emits a 10-second signal tone. The daily alarm reminds you about recurring events with an acoustic signal at the time you have set. You can also activate hourly time signals (each hour). This model has 5 independent alarms. Shock Resistant construction protects againt impact and vibration.